This is the influential 2009 book that bridged the worlds of sports, “sports entertainment,” and national politics, and helped put the concussion crisis on the map. 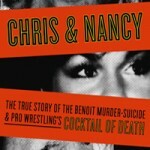 CHRIS & NANCY is the true-crime account of the events of June 2007, when WWE star Chris Benoit murdered his wife and their 7-year-old son, before taking his own life. The Benoit story spurred the research of chronic traumatic encephalopathy pioneer Dr. Bennet Omalu, inspired Congressional investigations, and impacted the Senate campaigns of WWE co-founder Linda McMahon. 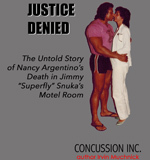 In 1983, Nancy Argentino — girlfriend of eventual WWE Hall of Fame wrestler Jimmy “Superfly” Snuka — died mysteriously in a motel room outside Allentown, Pennsylvania. 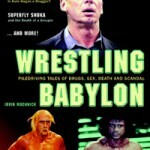 Author Irvin Muchnick’s 1992 article about the incident (later collected in his 2007 book WRESTLING BABYLON) is the most authoritative account of what happened. On the 30th anniversary of Nancy’s death, Muchnick has updated his material and added never-before-published photos and documents. In association with the Argentino family, all royalties from this project are being donated to organizations fighting domestic violence. Including facsimile reproductions of primary-source documents from civil lawsuits against the U.S. Olympic Committee’s governing body for competitive youth swimming, this follows the story of widespread sexual misconduct by coaches, which was first reported in 2010 by ABC’s 20/20. The book raises serious questions about whether Chuck Wielgus, the executive director of USA Swimming, has made good-faith reforms of USA Swimming procedures, and whether he has been truthful in public statements about the scandal – including sworn statements, under penalty of perjury, to courts adjudicating claims of victims. 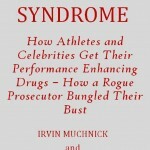 Performance-enhancing drug use is the scandal in big-time sports and Hollywood that won’t go away. This is the first investigative account of the botched prosecution of Internet human growth hormone dealer Signature Pharmacy, and its implications. The who’s-who cast of celebrities includes Sylvester Stallone and many other famous entertainers and athletes, and the story of the global marketing of HGH takes readers deep inside the treacheries of Olympic politics. Set against the backdrop of the most successful steroid bust in American history, Operation Raw Deal, THE CHINA SYNDROME ties together headline names, political and big-money interests, sociology, and borderless and anonymous intrigue behind HGH trafficking. 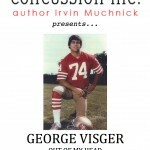 George Visger, a member of the San Francisco 49ers’ first Super Bowl champions in 1981-82, has lived with a shunt in his brain even since — a consequence of the many concussions he sustained during his football career. Despite suffering from “water on the brain” and impaired short-term memory, he became a wildlife biologist, a prominent figure in the fight for fair treatment of retired players by the $10-billion-a-year National Football League, and an advocate of solutions to the American football concussion crisis at all levels. This is Visger’s remarkable story. A 7,000-word investigation of the role in the sports concussion crisis of the University of Pittsburgh Medical Center and its doctors, principally Joseph Maroon, whose many hats include team neurosurgeon for the Pittsburgh Steelers and medical director of World Wrestling Entertainment. 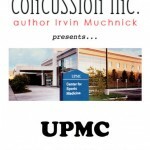 The book chronicles how UPMC’s Sports Concussion Program, launched in 2000, led to the development by Maroon and colleagues of the for-profit ImPACT Applications concussion management software company, whose research was underwritten by National Institutes of Health grants. In the era of “concussion awareness” promoted by the National Football League, ImPACT is marketed aggressively to high school and youth programs despite serious questions about its effectiveness. 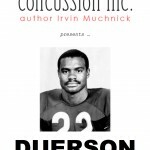 Exclusive new information on the February 2011 suicide of former pro football star Dave Duerson, and this bolsters the argument that the National Football League’s retirement and disability plan board, on which Duerson sat, should reopen all rejected disability claims on which Duerson had deliberated.